York Road is a disused station on London Underground's Piccadilly Line. It opened in 1906 but never saw a high volume of traffic. Eventually Sunday services were withdrawn and it closed completely in 1932. The station catchment suffered due to being on the edge of a large area of goods depots and marshalling yards behind King's Cross station with no habitation and little commuter traffic. This despite being about 1km from the adjacent stations on the line (King's Cross and Caledonian Road) and on the edge of central London. To the east of the station is the run-down residential neighbourhood of West Barnsbury, in the Borough of Islington. This neighbourhood is an excellent example of an area that fails to thrive precisely because of poor transport links. It would benefit greatly in prestige and development by having a local tube station. York Road station on the Piccadilly Line. Closed since 1932, current evidence suggests it would now be very useful. The case for reopening the station has not previously been strong. That is until the King's Cross Railway Lands Development scheme was announced (now called King's Cross Central). This scheme involves the mixed-use development of 65 acres of land to the north of King's Cross station - precisely the area of depots that have been the vacuum in York Road's catchment until now. This should bring thousands of new jobs and residents to the area. Preliminary work has begun. 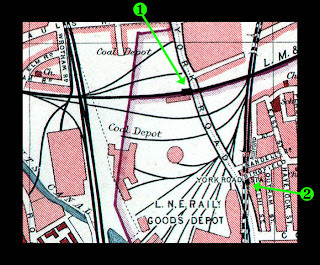 The reopening of York Road and also the construction of a new York Way station on the North London Line (London Oveground) close to the site of the former Maiden Lane station a little way to the north, have already been suggested by concerned parties (see map) though both Islington and Camden councils would seem to be in favour of the latter option. As is clear from the map, the York Road station is ideally placed for the northernmost part of the King's Cross central development (bound by Wharf Road). Pedestrian distances from the nodal centre of the site are far shorter than walking to King's Cross (250m as opposed to 808m). A viability study performed by London Underground found the station would attract about 3.2m passenger journeys/year. 1. The extra station would add around 30 seconds to through journeys in standing time and deceleration/acceleration. Multiplied by 38.4m this is a total time loss of 320,000 hours/year. Now, analysing the mean walking distances of passengers on the northern sector of Kings Cross central we see that the absence of York Road means average additional walking distances of 558m to reach the next nearest station (King's Cross St. Pancras) instead (808m-250m). At a walking speed of 4.5 km/h this is a 7.4 minute walk. Let us take this as the average additional distance for all passengers on our notional York Road station. Extrapolated over 3.2m passengers this represents a loss of 395,000 hours/year - 75,000 hours more than the delay to through passengers. what is clear is that York Road, although not on the scale of King's Cross or Finsbury Park would have a passenger traffic comparable to the next three stations on the line, and indeed greater than Arsenal station. 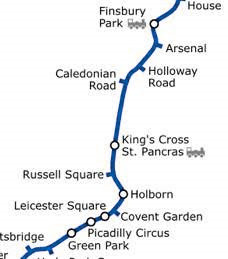 In fact it would have passenger figures higher than 17 other stations that uniquely serve the Piccadilly Line. By London Underground's logic shouldn't they be all closed down? 2. York Road is a station already constructed. Lift shafts, ticket office etc. exist already. The station would need major refurbishment and new platforms, but minor structural works. London Underground has the money to rebuild Shepherd's Bush (£65m) and Camden Town (£135m), compared to which the refit of York Road would be pocket change (LUL estimates for reopening South Kentish Town are £12m). King's Cross Central is a multi-billion pound development and the developers ought to be able to contribute. Reopening York Road would be in their interests. Long-term, running costs of the station would be no more than any other small Piccadilly line station though York Road would generate more revenue than many. The reasoning against reopening the station appears to be very weak. Revitalisation of a forgotten corner of Islington, very close to central London. There is a further, more costly option. That is to leave York Road abandoned, and York Way/Maiden Lane forgotten, and instead create a new interchange station between the NLL and Piccadilly Lines. This would be somewhere towards the back of Bunning Way, alongside the Eurostar Tracks out of St Pancras. As it currently stands station access to this site would be poor and would require major works. 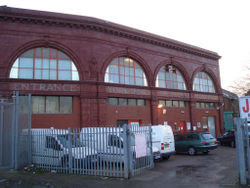 Further, the station would impact the viability of Caledonian Road & Barnsbury Station, 400m along the line to the east. The interchange component of such a station would be extremely useful however. Or you could build an interchange station at Maiden Lane, that uses the existing platform tunnels at york road, and only abandon the surface building. A bit like Green Park, where the original station building was some distance away on Dover Street.